The liberal filmmaker shared his presidential prediction at the Republican National Convention in Cleveland during a special edition of the longtime HBO political panel program "Real Time with Bill Maher." "I'm sorry to have to be the buzzkill here so early on, but I think Trump is going to win. I'm sorry," the 62-year-old Moore proclaimed to gasps and boos from the progressive live audience. "Boo if you want." Moore's rationale for a Trump victory includes angry white voters and the United Kingdom's vote to leave the European Union — known as Brexit — that sent shockwaves around the world in June. "I live in Michigan. Let me tell you, it's going to be the Brexit strategy," Moore said. "The middle of England is Michigan, Wisconsin, Ohio and Pennsylvania," he continued. "And Mitt Romney lost by 64 electoral votes. The total number of electoral votes in those states in the Rust Belt: 64. All [Trump] has to do is win those four states." 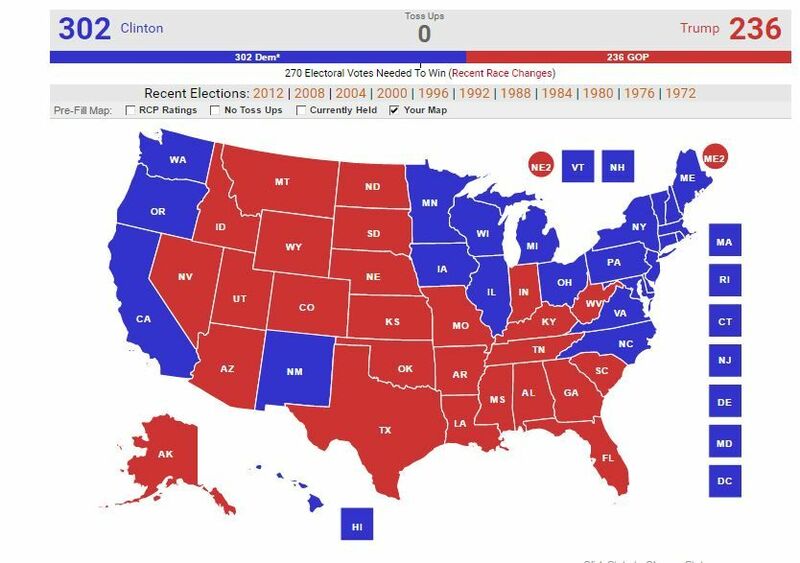 President Obama won by 126 electoral votes over Mitt Romney in 2012. But if the aforementioned four states and the 64 electoral votes that go with them collectively were to be flipped, Romney would have won that election 270-268. Earlier in the day, Moore was much more pointed in his backhanded praise of Trump. "He knows how to manipulate a dumbed-down population," he said at a press conference. "The population of schools has been wrecked, and the news media is just insipid and stupid and doesn't give the people the facts about what's going on," he explained, calling American voters, "easily manipulated." "He's [Trump's] not as stupid as he looks. You should take it very seriously," the director of "Fahrenheit 911" and "Roger and Me" warned. "He knows the manipulation that's going on here, and the use of propaganda and the way he's doing it is just brilliant in the way that he is succeeding and has succeeded." According to the RealClearPolitics average, Hillary Clinton and Donald Trump are in a statistical dead heat nationally with 109 days to go until Election Day. Clinton's lead is down to 2.7 points, within the margin of error. Hillary Clinton has about a 74% chance of winning the presidency. 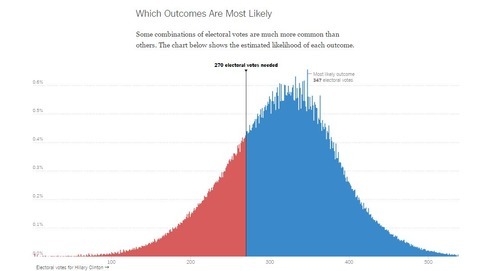 To forecast each party’s chance of winning the presidency, our model calculates win probabilities for each state. In addition to the latest state polls, our forecast incorporates a state’s past election results and national polling. 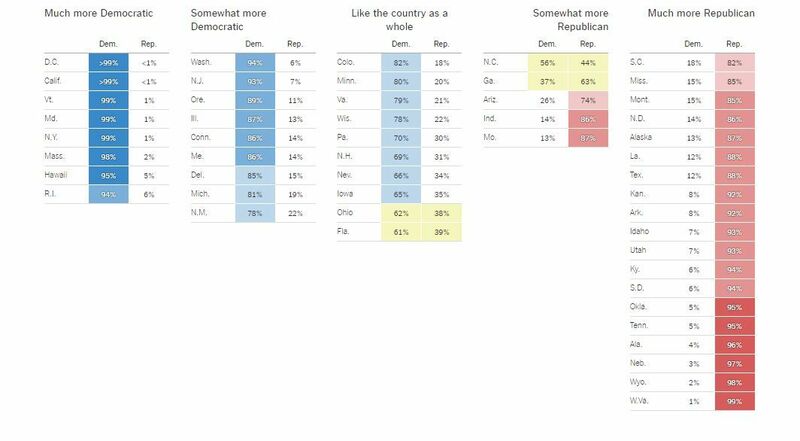 The table below shows our model’s estimate for Democrats and Republicans in all 50 states and Washington, D.C. We have put the states into five groups based on their voting history relative to the nation since 2004. The interactive diagram below illustrates Mr. Trump’s challenging path to the presidency. 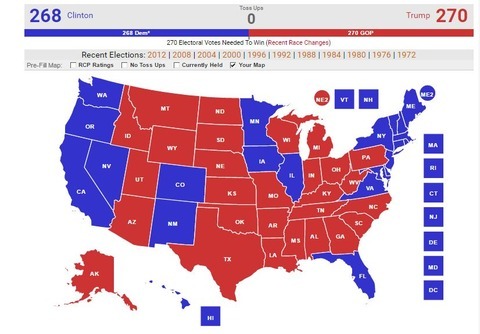 Here, we assume Mrs. Clinton and Mr. Trump will win the states where we believe they are most strongly favored, and we let you control the outcome of the 10 most competitive states. Above all, this diagram illustrates how important Florida is to Mr. Trump. It is extremely difficult for him to win without it. Select a winner in the most competitive states below to see either candidate’s paths to victory.